Gallant 5ft Free standing Heavy Duty Filled Boxing Punch Bag Partner Kickboxing Training Martial Arts MMA. Freestanding Punch Bags are great for people that don’t want to put up a punch bag or simple can’t. Free standing Punch Bags are great alternative and simple solution. Simply fill the base with Sand or Water to add weight and start using them. 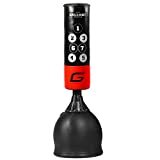 Gallant Free standing Punch Bag is excellent for training, develop co-ordination and skills without the need for a partner. Constructed from Multiple layers of Shock Absorption EVA Foam Layers, finished with Grain Artificial Leather. Soft Upper Layer with Heavy Dense Inner Layers of Foam Padding Striking Area. Excellent for Boxing, practising Punching and Kicking to help improve accuracy and make combinations.